"Quick easy snack that the kid's can help make - especially if you have an air popper. Beware, this can become addictive!" Heat oil in a large pot or saucepan over medium-high heat. 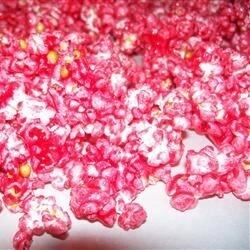 Pour in the popcorn, cover, and shake a couple of times to coat the kernels with oil. When the corn starts to pop, shake pan continuously until popping stops. Pour popped corn into a large paper bag. Combine the butter, corn syrup and red hot candies in a microwave safe bowl or saucepan. Heat, stirring occasionally until the candies have melted. Pour the hot syrup over the popped corn, and shake the bag for 1 minute, until completely coated. Cool, and serve. I think next time I'll add more red hots but there is nothing wrong with it the way it is either. It was really good the first night but the second evening it was awesome!